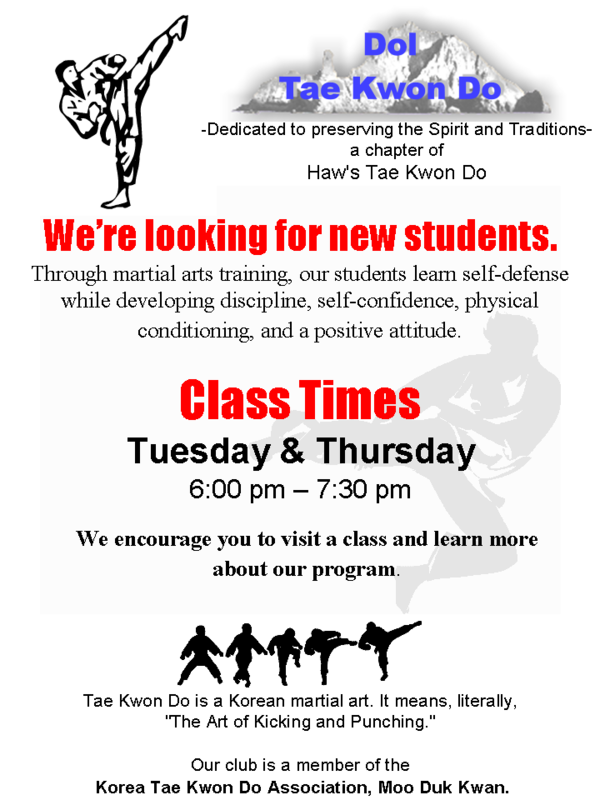 The MSIC chapter of Haw’s Tae Kwon Do School was established on 7 December 1999 by Dr. Peter Varmette, (a 1st Dan at the time). Dr. Varmette studied Tae Kwon Do while attending Mississippi State University under the instruction of Dr. Rodney “Buz” Piercey. Dr. Piercey studied under Mr. Haw in Nashville. We currently meet 5 times a week; the schedual is shown below. We perfer that a perspective student come and watch a class before actually taking part in the class. When starting proper attire would include loose fitting sweat pants and a loose fitting tee-shirt.